Thanks to a resounding defeat in the 2018 midterm elections, Trump faced an audience the majority of whom were not members of his party or worldview as he began his appeal for unity. “The agenda I will lay out this evening is not a Republican agenda or a Democrat agenda. It’s the agenda of the American people,” Trump said, yet all around him were symbols of division and disagreement. It began with the woman over his left shoulder, Speaker of the House Nancy Pelosi. It was Pelosi who insisted he move the date of his speech back a week after the government shut down over funding he demanded for partial construction of his border wall. 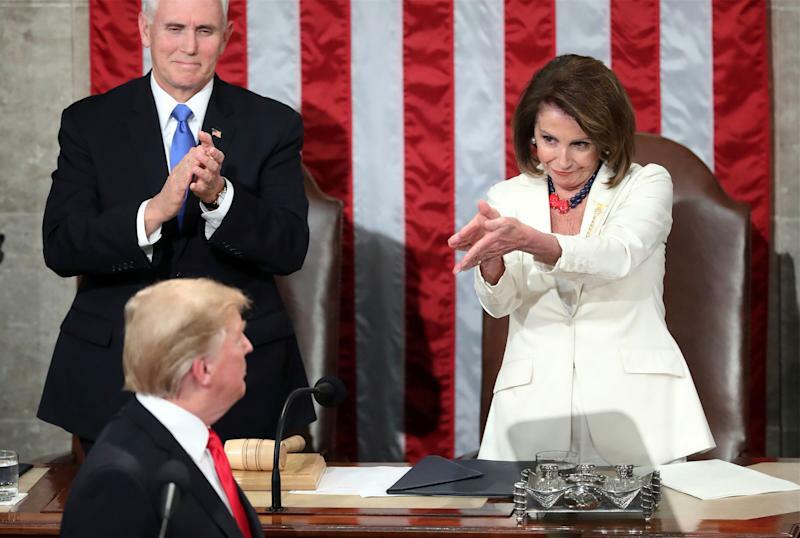 And it was Pelosi who clapped all but in his face, like a mother who is sending a child a message, when he mentioned the word "compromise." 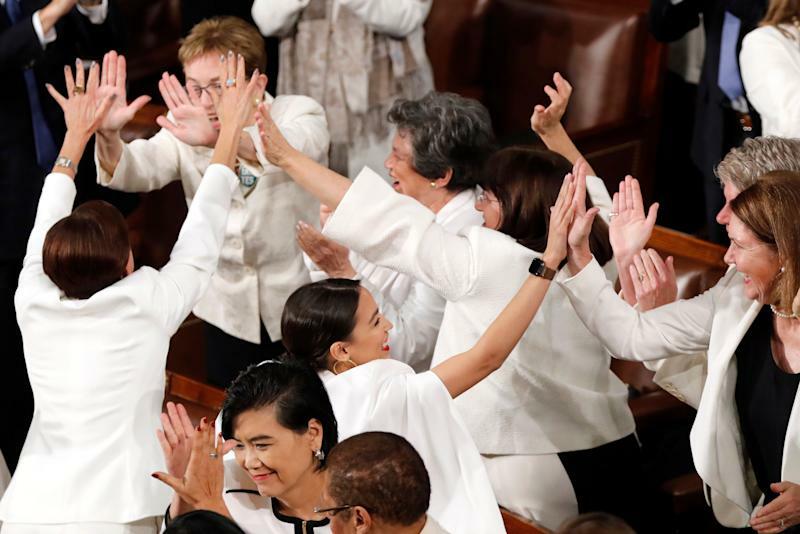 The divisions in the House chamber became more apparent in the rows of Democratic women dressed all in white, the color of the suffragette movement. (Tiffany Trump was also wearing white, causing excitement on Twitter.) When the president got to the part of his speech that claimed credit for the fact that women filled 58 percent of the new jobs created in his administration, those women looked at each other wondering whether that was something that Democrats should applaud. They soon did, pointing to themselves, because, after all, they filled some of those jobs. For every time Trump mentioned an accomplishment, there seemed to be a living example in his audience to either challenge or underscore his point. Most were guests of either the president and first lady or of a member of Congress — an invitational tug of war that has become as much a part of the annual speech as the partisan applause. While stating that we “have a moral duty to create an immigration system that protects the lives and jobs of our citizens,” Trump spoke to a room that included Linda Clark, a Liberian refugee and 18-year resident of the U.S., the guest of Representative Ilhan Omar, Democrat of Minnesota, herself a Somali refugee. While urging that Congress respond to what he called “an urgent national crisis” and “secure our ... southern border” against “large organized caravans ... on the march to the United States,” he was standing in the same room as Yeni González, a mother who was separated from her three children at the border, there as the guest of Rep. Adriano Espaillat, D-N.Y. When he described a New York law that allows abortion after 24 weeks if the life or health of the mother is at risk or the fetus is not viable as “ripping babies from the womb minutes before birth,” his audience included Pelosi’s guest, Dr. Leana Wen, the new president of Planned Parenthood. Sometimes both parties competed to prove the same point. Talking about the First Step Act, which eases sentences for drug offenses, he introduced the newly released inmate Alice Johnson. As she wept with gratitude, Sen. Corey Booker was seen nodding. His guest for the evening was Edward Douglas, who last month was released from prison by the new law. But those moments did not seem enough to erase the pervasive atmosphere of discord. If the scorecard of a State of the Union is the applause given, or withheld, to a commander in chief by members on both sides of the aisle, the most telling moment might have been the one when Trump criticized the many investigations into his administration. “It there is going to be peace and legislation, there cannot be war and investigation," Trump said to, at best, a smattering of applause in the chamber.